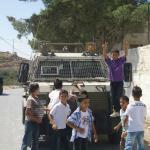 On Friday 14th September 2012 demonstrators from the village of al-Masara gathered for their weekly demonstration against the occupation, where they were confronted by Israeli Occupation Forces (IOF). Situated approximately 13km southwest of Bethlehem, and close to the town of Beit Omar, Al-Masara is an agricultural village that faces great hardship due to the theft of the village's land by Israeli settlers and the IOF; the expansion of the Apartheid Wall; and the village's close proximity to the Gush Etzion settlement block. The demonstration left the centre of the village at approximately 1pm, and made its way towards the entrance to the village, and tried to proceed to the village's agricultural lands. However the IOF closed the entrance to the village, preventing the villagers from reaching their lands. Friday's demonstration also marked the 3rd anniversary of the murder of Qahir Aladdin, a member of the People's Committee of the village of Al-Masara in 2009, and came two days before the 30th anniversary of the massacre of Palestinian refugees in the Lebanese refugee camps of Sabra and Shatila. Between 16th and 18th September 1982, Lebanese Phalangist militias murdered around 3000 Palestinian refugees according to the Palestinian Red Crescent. The Israeli army, who controlled all access to the camps, allowed the armed Phalangist militias to enter the camps and facilitated the slaughter by firing illuminating flares over the camp. Separated by almost thirty years and countless walls and soldiers, the death of Qahir Aladdin and the refugees of Sabra and Shatila illustrate the scope of Israel's crimes against the Palestinian people. The IOF, whether in small agricultural villages in the West Bank, or in densely populated refugee camps in Beirut, fool no one when they claim to be ?the most moral army in the world?. From al-Masara to Beirut, and from Scotland to Brazil, the truth of Israel's crimes is increasingly clear for the world to see. As the BDS movement intensifies and scores more victories against the Apartheid State, we come closer to the day when Israel will once and for all be held to account for the deaths and suffering which it is has inflicted on the Palestinians, Lebanese and other peoples of the world. No justice, no peace.